Surjewala alleged that the BJP promised farmers to determine minimum support price for crops as 'cost plus 50 per cent' but failed to implement it. 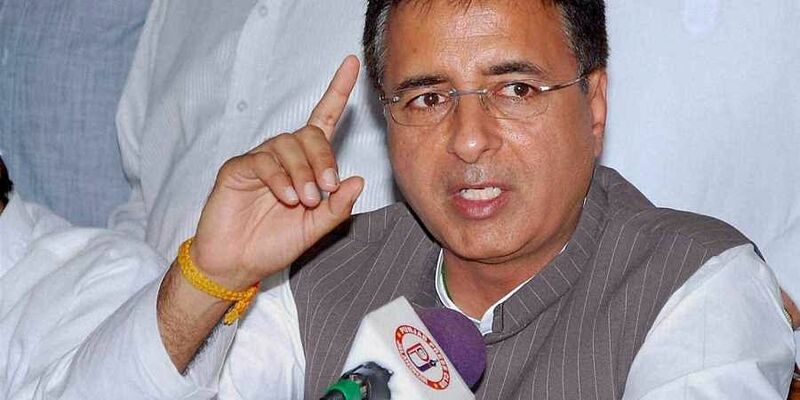 BHOPAL: Placing the ruling Bharatiya Janata Party (BJP) in the cross-hairs for agrarian distress in Madhya Pradesh, Congress spokesperson Randeep Surjewala today said that the Shivraj Singh Chouhan and the Narendra Modi regimes have proved to be anti-peasant. "On the one hand, peasants are shot dead in Madhya Pradesh for demanding remunerative price. On the other hand, farmers are brutally assaulted on the occasion of Gandhi Jayanti by the Modi regime," Mr Surjewala told media persons here today. He alleged that the BJP promised farmers to determine minimum support price (MSP) for crops as 'cost plus 50 per cent' but failed to implement it. On the contrary, the Shivraj dispensation ended bonus of Rs 150 per quintal being provided to farmers as soon as the Modi regime came to power. "The number of farmers' suicides in Madhya Pradesh is growing at 21 per cent per year since 2013. The state ranks third in the number of suicides by farmers. Provided that a small portion of the amount earmarked for farmers actually reached them, their condition would not have been so pitiable," said Mr Surjewala. Mentioning that the previous United Progressive Alliance (UPA) Government waived farmers' loans to the tune of Rs 72,000 crore in the lump sum, Mr Surjewala said that the Modi regime wrote off debts amounting 3.17 lakh crore of his industrialist friends but the same yardstick is not applied for poor farmers. "A Jan Ayog would be constituted soon after the Congress comes to power in Madhya Pradesh. Corruption done during the tenure of the Shivraj regime would be investigated and stringent action taken. Besides, loans of farmers would be waived, and steps would be taken to make agriculture a profitable business," he said. Launching a scathing attack on the Centre, he claimed that non-performing assets (NPAs) increased from Rs.2.73 lakh cr in 2014 when the BJP came to power to Rs 12 lakh crore at present.